I found these channels really fascinating. (I also may have binge-watched like all of Jaiden's and James' videos.) All this genre is is people talking about things that happened in their lives, complete with some simple Flash animation. These storytimers tell stories about funny or interesting things that happened in their past, or strange fears they have, or just random thoughts. Do you know why these are fascinating to me? I mean, okay, maaaaaybe the fact that like half the webcomics I used to read happen to be slice-of-life style things, and I am just an absolute sucker for those things. But it's a touch more than that. Sometimes, when I'm in a bit of a rut, I convince myself that life is kind of boring. I mean, I'm just, well, me. I wake up at whatever o' clock every weekday, walk to class, listen to a lecture or something, do some homework or whatever, talk with some people sometimes, and then go home. It seems boring, routine. I do it every day. It's not really that interesting day-in and day-out. There's no way I'd ever get millions of Youtube subscribers if I just sat down and talked about that... right? Meanwhile, take James from theodd1sout. Before the whole YouTube thing became his career, he was a perfectly average dude. He woke up every morning, drove to a Sooubway, and made some sandwiches. By every possible respect that shouldn't be interesting. But despite that, James has made 3 incredibly fascinating videos just on his fast food experience. Because, yeah, maybe in the day in and day out his job consisted of sitting around waiting for customers at his perplexingly desolate Subway shop. But that's actually interesting. It's interesting because to someone like me who hasn't worked at a Subway for a year day-in day-out, the mundane stories he tells about strange customers and even stranger store policies are like stepping into a completely different person's take on life. Other videos let me explore more perspectives. Like, what was life growing up in a place without winters? Or what would it have been like if I learned how to play the piano growing up? But the "escape into someone else's life" sort of videos aren't all these people offer. The other "type" of videos are where the Youtubers talk about their feelings about and relationships with a thing. Like, say, how is theodd1sout's experience with the typical school science fair different from mine? What did Jaiden think of Halloween growing up? These are cool because I can relate to how they feel and compare my experiences with theirs. And there's the point I'm getting at. When I'm stuck working at a fast food resturaunt over the summer or doing schoolwork for university, sometimes life gets a touch boring and stale. And it would be wasy to think that I like videos like these because they allow me to escape my own reality and pretend that I'm someone else. But that's not why. Everyone has different answers to the questions these videos pose. And that's because all of us had different experiences growing up. Experiences that, trust me, are just as interesting and funny as the famous Youtubers with millions of subscribers. Your life, whether you know it or not, is positively fascinating. These videos (among other things, of course) give me the perspective to say "Hey, my life IS interesting, and people might actually be interested in getting to know me." Because I don't need to have any grand accomplishments or be an expert in anything or have a prestegious degree hanging on my wall to get people interested in me, and neither do you. I mean, come on, a dude who worked at Subway and drew some comic strips in high school has over 3 million YouTube subscribers. Dude didn't even get to finish college. Of course, I realize that not everyone can get millions of Youtube subscribers or Twitter followers by being themselves. The storytimers do so by a combination of presenting their lives in a super interesting format and sheer luck in getting noticed on the Internet. But even without the entire internet breathing down our backs (and, at least in SomethingElseYT's case, breaking into our backyards and staring into our homes) you and me are still interesting people. Random but relevant story of my own. Back in my senior year of high school, I was in an off-campus pre-engineering program which took up 2 hours + lunch from Monday to Thursday. For Friday, there was no class (officially there was a study session, but we so weren't going to waste gas to go sit in an empty classroom), so you could just sort of do whatever. Often me and my friends in the program ended up sitting in a back room of the school or cruising around our itty bitty town looking for things to do. But one day I felt like taking a solo hike down an old rail trail that ran right next to the school. It was a bit of a trek. Had to climb over some large branches laying in the middle of the path, because some nearby farmers decided that paving and maintaining that part of the trail would lead to disaster, or something like that. But hey, it made the walk quite a bit more scenic... even if I was surrounded by posted property signs nailed to trees the whole time. 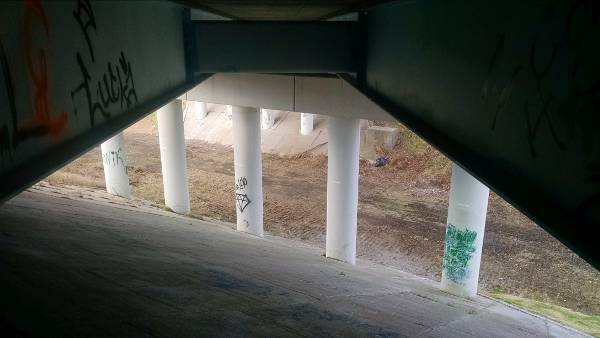 Eventually the trail ran underneath a highway overpass. And it wasn't some dinky little bridge either, this thing was several stories up. I decided that the overpass was a decent place to stop and turn back. But not before I climbed up the side and chilled underneath the bridge. Let me tell you, it's a really strange experience having cars and trucks whizzing by a foot over your head while there's a rather steep slope in front of you. Kind of fun, in the same way an amusement park ride is. Anyways, around this bridge was graffiti. Not a whole lot, but it was definitely there. (It was a bridge right next to a rail trail, after all.) I got to looking at it from my perch up above. Who drew these? What were they like? What inspired them to express themselves on a concrete pillar? The world is kinda cool, don't you think? You've got that neato lake to the left, and the sheer awesomeness of this 1960-something bridge. And there's you. I don't know who you are. Maybe you're an adventurer like me. Maybe you've got no better place to be, no better thing to do. No matter what, you're cool. To me, that seems boring. It's just my life, after all. But to you, you're curious. Who am I? What are these courses? Why are you walking on a bike trail alone? What better things do you have to do? Guess what? People feel the same about you. I don't know who you are, but I find you fascinating. Maybe you're a graffiti removal guy with a stressful home life. Maybe you're homeless, and you sleep to the sound of trucks whizzing over your head. That's genuinely fascinating to me, to all of us here. So, what's your story? Write it on the back. I seriously considered leaving that letter there with my pen for people to write their stories on the back, But then I realized that maaaaaybe having proof of me tresspassing on a highway overpass during school hours was a really terrible idea, so I pocketed the thing. Good timing too, because after literally sprinting back to the school I arrived with about 3 minutes to spare before class started again. Looking back, those Storytime Youtubers have answered that question for me anyways.